Kanagawa Prefecture has the secondary largest population in Japan. 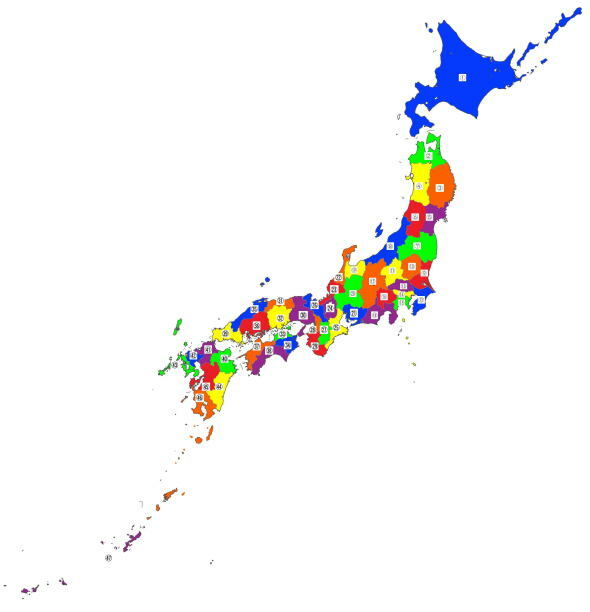 The largest population is in of course Tokyo, the next is in Kanagawa Prefecture, it is over 90 million people. Yokohama, Kawasaki, Yokosuka, Kamakura and Hakone are famous cities belonging to Kanagawa Prefecture. The name of Kanagawa Prefecture named after the post town Kanagawa inEdo period, so it had a Bugyosho (a policestaion), it was called Kanagawa Bugyosho. Kanagawa prefecture, so to say , named after it. Kanagawa is located on the south of Tokyo, and it is surrounded by seas, such as Sagami Bay in the south and Tokyo Bay in the east. Across the Tokyo Bay, there is the Boso Peninsula in Chiba Prefecture. And the western part of Kanagawa Prefecture, there stands Tanzawa Mountains. Moreover, the Tokai-do road was there along the oceanfront of Kanagawa Prefecture, therefore Tokai-do Shikansen runs in the Kanagawa. So Kanagawa Prefecture has been on the way to the East from Kyoto since ancient Japan by sea. Therefore it was called To (east) kai (sea) do (road), it was the east sea road. Now billions of people pass through Kanagawa Prefecture to Tokyo from the western Japan and also thousands of ships come Yokohama Bay every year. So Kanagawa has been the great highway connecting east and west Japan since the ancient ages. Therefore some cities have developed as post towns such as Hakone, Odawara and Kamakura since the early historic ages. Kanagawa prefecture was registered in 1871, before that it was called Sagami-no-kuni (Sagami Province) and the southern part of Musashi-no-kuni (Musashi Province). Sagami-no-kuni was the gate way to the east Japan. In 716, Sagami Province was registered. In 1063, Yoriyoshi Minamoto build Iwashimizu-Hachimangu Shrine in Kamakura, so the shrine was the god of samurai worriers, the Minamoto Clan worshipped it in Kyoto for a long time. It is the famous shrine, Tsurugaoka Hachimangu Shrine. In 1192, Yoritomo was appointed as the Shogun and founded Kamakura Bakufu (the Kamakura Shogunate) in Kamakura. Kamakura was the center of the samurai society in Japan, and this was the first sumurai government to control throughout Japan and this is the first time that Kanagawa Prefecture appeared on the main stage of the history of Japan. Kamakura Bakufu ended in 1333. When Muromachi Period started, Muromachi Bakufu established Kamakura-fu (a regional office of the Muromachi Bakufu)to rule the eight provinces in Kanto Region. The director of the office was Kamakura Kubo (Kamakura shogun), but Kanto Kanrei (the chief counselors of the Kamakura shogun) seized the power to control the region in real. This relation between them caused some conflicts in Kanto Region. The Battle of Kyotoku happened, so the Kamakura Kubo Shigeuji Ashikaga assassinated Kanto Kanrei Noritada Uesugi. It was the beginning of the Sengoku Period in Kanto Region. 1495, Soun Hojo (the founder of Go-Hojo Clan) seized the Odawara Castle in western Kanagawa Prefecture. After Soun moved to Odawara, he developed his influence through the area of Kanagawa Prefecture actively and aggressively, and his clan had ruled it almost 100 years. In 1590, Hideyoshi Toyotomi who was the was the Kanpaku Dajo-daijin (the supreme minister and chancellor) won the Siege of Odawara, the Hojo Clan ruined, and Ieyasu Tokugawa moved to Kanto, and he ruled the region at Edo Castle. Since Ieyasu Tokugawa held the power to control Japan and founded Edo Bakufu (Edo Shogunate) at Edo (Tokyo) in 1603, the most parts of Kanagawa Prefecture were directly controlled by Edo Bakufu (Tokugawa Clan), and the rest of it belonged to the small lords who had hired by the Bakufu directly, because Kanagawa was very important area to keep Edo Bakufu stably in Edo Period. The Hakone Barrier was built on Tokai-do road in 1619 to protect Edo, and Tomei-do Light House was built in 1648 at Uraga port in Kanagawa Prefecture to help the shipping. Finally, the United States Fleet commanded by Matthew PERRY came to Japan, and he ordered to open Japan to the west in 1853, and Yokohama port opened in 1859. This caused to break down the Edo Bakufu. However, this was the beginning of the development of Yokohama and Kanagawa Prefecture. After Meiji Restoration, the classical districts were rebuilt, and a new administrative district 'Kanagawa' was created in1871. Now, there are thousnds of landmarks, as to say, kanagawa Prefecture is the landmark itself. Kamakura has many National Treasures and Important Cultural Propertyies, Odawara has the Odawar Castle, Hakone has some hot springs and Lake Ashinoko. Why don't you visit Kanagawa Prefecture! No.15 in the map below is Kanagawa Prefecture.